6 Wednesdays, 6 to 9 p.m. This class is designed to help you improve the specific skills you need to create keepers in the field. Each session, we will practice one essential part of the plein air craft: perspective drawing, "lost and found" edges, paint application, working quickly, and more. Class time will be spent on tailored exercises, so don’t plan to finish a painting during our sessions. In case of bad weather we will meet indoors at my studio. To register, complete and mail this form with payment. Supply list will be provided upon sign-up. Photos don't do winter justice, so it's a shame to waste such beauty by painting indoors. With the right gear and attitude, painting outside in the winter is doable—even enjoyable! We'll meet in my studio Friday evening at 6:30. I'll talk you through the necessary gear (especially how to keep your fingers and toes from freezing) and will do a demo focusing on how to paint a good field study quickly. On Saturday, we will go out for two 3-hour painting sessions (South Minneapolis locations). We'll take a break between sessions to warm up, have lunch, and share notes from the morning. $185 for the three sessions. To register, complete and mail this form, with payment. Supply list will be sent upon sign-up. Let me help you make sense of the circus of color out there in the fall. Saturday evening: Lecture and demo at my South Minneapolis studio, 6:30-9:30 p.m.
Sunday morning: Outdoor painting session, 8:30-11:30 a.m.
Sunday afternoon: Outdoor painting session, 1:30-4:30 p.m.
Beginners will learn the basics of outdoor landscape painting, the gear required, and how make sense of a scene. You'll focus on how to start a small painting. 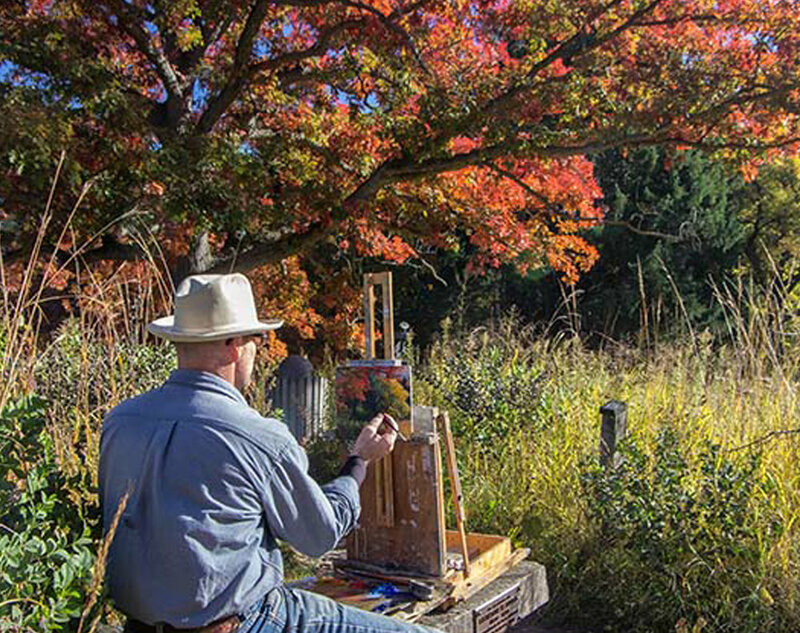 Intermediate students: Advance your plein air craft to the next level. Learn tips to create a greater sense of light and spatial distance. Explore how to choose more compelling vantage points and design strategies for how to compose a more dramatic picture. Every workshop I teach is tailored to the participants, so each one is a little different depending on the group. When registering, please indicate your experience level and what you would like to work on, or call or email me and we can discuss your craft. What are your strengths and challenges as a painter? How can I best help you expand your skills? To register, complete and mail this form with payment to address below, or send me an email. You will receive a supply list upon registration. New paintings! Refreshments! Stop by! Friday, June 15, 6 to 9 p.m.
Saturday, June 16, 11 a.m. to 4 p.m.
Scott's painting, Crescent Bay Morning, was selected for the third annual Airstream Fine Art Invitational. The exhibit runs May 16 through June 2 in conjunction with Alumapalooza, the annual gathering of hundreds of Airstream enthusiasts. Reception Wednesday, May 30, 6-8 pm featuring a quartet performance by the Lima Symphony Orchestra. Refreshments provided. Featuring paintings that recall memories, tell a story. I'll present ideas and images about picture making, and will block in a 24 x 36" canvas while discussing painting process questions such as how to start and how to move quickly. This lecture is one in a series sponsored by Outdoor Painters of Minnesota. An OPM paint-out follows the demo. 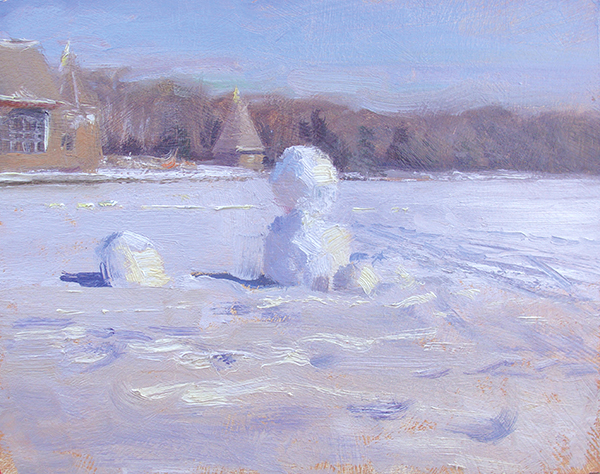 If you're interested in outdoor painting, consider joining OPM, and, to get a jumpstart on the craft, sign up for my Winter Workshop!